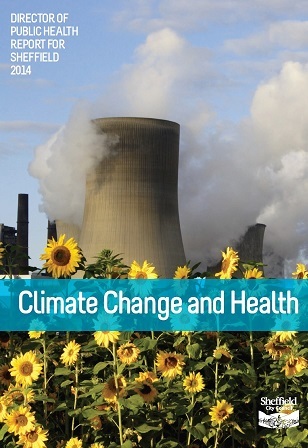 The annual Sheffield public health report has been published and this year the focus is on Climate Change. All of the topics in the report impact both public heath and climate change. Climate change is the defining public health issue of this century. I’m very happy that such an important issue is right at the top of the public health agenda in Sheffield. There are however links between present public health problems and the kind of steps we have to take to tackle climate change. Many of the things we need to do to reduce greenhouse gas emissions will benefit our health in the short term, too. We describe some of those things. This is quite a good video of Dr Jeremy Wight explaining his annual health report. As we know all too well, many the things that will help with climate change will help with more short term public health problems and Jeremy Wight sums this up very succinctly. Active travel (walking and cycling) and public transport increases physical activity and social connections, improves physical and mental health, helps people stick to a healthy weight, and reduces harmful air pollution and greenhouse gas emissions. The recommendations focusing on active travel are right at the top of the list. The Council should develop and implement a programme of signposting walking routes with the time it takes to reach the destination. Sheffield people should consider traveling short distances on foot or by bicycle rather than by car, and sign up to ‘Move More’ at www.movemoresheffield.com. The Council should commit to increasing the number of 20 mph zones within the City as quickly as possible. I don’t think that the reports recommendations for active travel will bring about a big enough shift on their own, there seems to be a focus on encouraging (signposing walking routes, people should consider travelling short distances on foot or by bicycle) rather than creating an environment where this is normal and designed in everywhere so that walking and cycling are real choices. I wish that the recommendations in this report were more robust and pushed us to change the way we design our streets. We’ve seen examples in Sheffield recently where the walking and cycling environment has been eroded to increase capacity and reduce delay to motor traffic. Until we improve the environment, the encouragement will be wasted and we’ll only reach small numbers of people willing to cycling in today’s uninviting and hostile conditions, the low hanging fruit. However, judging by the response I’ve heard Dr Jeremy Wight got at the council meeting where this was presented, he’s going to need all the support he can get! The discussion also revealed that the chair of the Sheffield Council Cycle Forum, Peter Price, isn’t convinced about climate change being caused by carbon dioxide emissions! We have the 20mph recommendation which should help to slow down traffic on our streets. Sheffield is very keen on 20mph areas and 11 more areas are planned for the coming year (10Mb pdf map). I’m still nervous that 20mph as we’re rolling it out will have as big an impact as we’re hoping, I think that it needs to be accompanied by a reduction in traffic volumes too, the benefits are amplified when the volume of traffic is reduced. There seems to be a slow realisation that there are problems with our main roads (which haven’t historically been included in 20mph areas) and we’re beginning to see ‘advisory part time 20mph limits’, a top for another post. Whilst improved road safety alone justifies 20 mph limits, air pollution and traffic noise drop when speed is reduced and streets become more pleasant and attractive places. Increased use of shared public space contributes to an increase in social capital. Link to the Sheffield Public Health Report 2014. The Star have reported today that Dr Jeremy Wight is resigning. The Shields Gazette has published an interview with Jeremy Wight discussing some of this. he says that “it’s absolutely not true that that [response to his report] has contributed to my decision to leave”. Dr Wight recently presented his annual report to Sheffield councillors. Some suggested he was given a bit of a rough ride for choosing to focus on climate change in his report. He said: “Last year, for 2014, I made the theme of my report climate change and health. “I think that if you look at what the big health issues are going to be for the rest of this century, I think climate change is number one. “If the predictions about climate change come true, it affects every aspect of our ability to lead healthy lives, including food production and water supply. “People have made some very, very grim forecasts. The reason I chose to focus on it is because there are things that we can do now that will help to mitigate the impact of global warming. “For example, fitting better insulation in your home. If people used more physically active transport, that is good for people’s health and reduces emissions. The response to his report was not the reason he chose to leave. He said: “I think the response was that there are a lot more pressing problems now like the impact of welfare reforms. But it’s absolutely not true that that has contributed to my decision to leave. This entry was posted in 20mph, air quality, council on January 2, 2015 by Matt.